At last a piece of good news. Mayor of London Sadiq Khan has finally withdrawn support for the proposed Garden Bridge across the River Thames, effectively killing the project. After a report by a committee of MPs earlier this month said the bridge should be scrapped, any other decision on the part of the mayor would have been just the latest in a series of scandalous decisions wasting yet more public money on this vanity project. I have been among those opposed to the bridge from early on. Anyone who knows the South Bank will know that it is already usually packed with people, given that it is home to many attractions such as the Royal Festival Hall, the National Theatre, the Hayward Gallery, the London Eye and the Aquarium, not to mention numerous restaurants. The last thing this area needs is another tourist attraction, and tourist attraction is exactly what this so-called bridge was. It wasn’t to be built in an area that needed a new bridge: there are two bridges nearby, and the northern end would land at Temple which is a quiet area where law firms are based, not so popular with visitors. The bridge would be privately owned, cycling would not be permitted, it would be closed at night, and could be closed in the daytime for private functions. Many people were also upset that it would block views across the river to St Paul’s Cathedral. My main objection was to the damage it would do to the South Bank. If you walk east from the Royal Festival Hall, you soon come to an area where the riverside walk widens out. This is a welcome breather from where it is rammed full of tourists closer to the London Eye, and offers an opportunity to enjoy strolling along the river for a short distance with slightly more space. 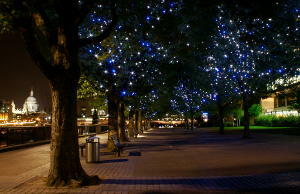 This part of the path is lined on both sides by mature trees which are strung with blue and white lights, making it equally appealing at night. This is just the area where the southern end of the bridge would have “landed”. Indeed, the so-called Garden Bridge would have resulted in the felling of many mature trees, and in their place would have been a concrete building housing 350 square metres of commercial space. The bridge would have spoilt one of the most pleasant stretches of the South Bank. I’m glad it will no longer go ahead. What needs to happen now is that the people who have allowed £40 million of public money to be spent on this project before any construction had even started need to be investigated, starting with former mayor Boris Johnson. It’s not that a garden bridge is a bad idea in itself. This was simply the wrong place, and the way the design was chosen was verging on the corrupt. (Anyone who just knows Thomas Heatherwick for his work on the 2012 Olympic cauldron might do well to consider his contribution to the 2002 Commonwealth Games.) Why not construct a garden bridge somewhere that actually needs a bridge, and could do with the extra footfall a new attraction will bring? Happily, it was the Garden Bridge that fell and not the South Bank’s trees. Hopefully a few egos will fall with it. I share your joy at the Garden Bridge being shelved. Now I’d like the mayor to consider my alternative. Orchestrating songs, or singing orchestral tracks?